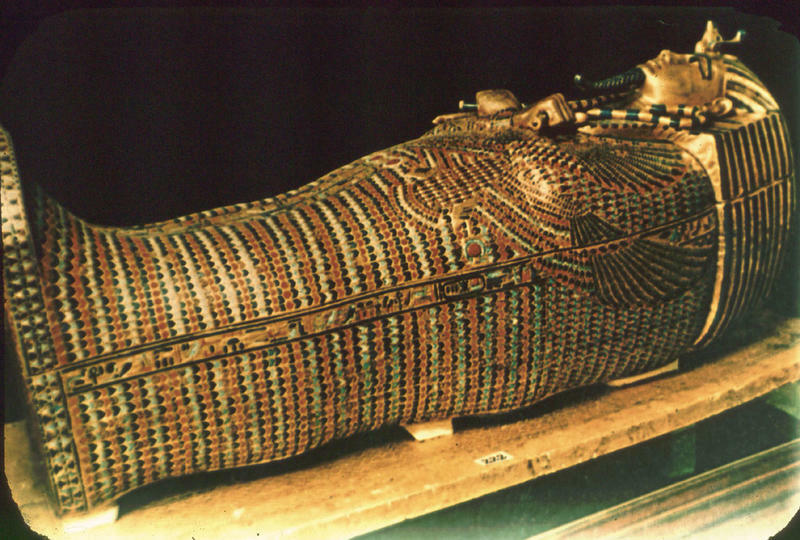 Different mummification methods were used by Egyptian embalmers at different times. Here are some details of a classic method also used on Tutankhamun. Soon after death, the dead body is transported to the embalmer’s workshop. The body is placed on a slopping table, stripped, and washed in natron solution - a naturally-occurring salt that serves both as a preservative and soap. The brain is taken out from the skull made through a hole in the ethmoid bone, which separates nasal cavity from the skull cavity. Then the intestine, lungs, liver and the stomach is pulled out by creating an incision on the left flank. These organs are kept as they will be buried together with the mummy. The corpse is then packed inside and out with natron with the toenails and fingers tied in place. After 40 days, when the body becomes entirely dry, the body is then cleansed with oil and covered with linen to restore its shape. The embalmer uses a mixture of bandages, linen sheets and pads to give the mummy a life-like appearance. But wrapping is a long and difficult process so to ensure its protection, a mix of amulets and charms is distributed within the bandages. Lastly, the mummy is placed in the coffin.